The sandals from the Glamour style of Gianluca - The leather craftsman are made from high quality laminated leather from local tanneries. Available in ten fashionable colors: yellow, red, fuchsia, lilac, orange, bronze, titanium, gold, silver and turquoise. Glamour style There are 11 products. White greased vachetta leather strappy sandals with leather sole handmade in Italy without the use of foreign labor or child, but by experts in the best tradition of craftsmanship. White greased vachetta leather gladiator sandals with leather sole handmade in Italy without the use of foreign labor or child, but by experts in the best tradition of craftsmanship. Bronze laminated leather gladiator sandals with leather sole handmade in Italy without the use of foreign labor or child, but by experts in the best tradition of craftsmanship. 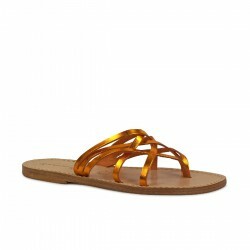 Thong flat sandals in yellow laminated leather with leather sole handmade in Italy without the use of foreign labor or child, but by experts in the best tradition of craftsmanship. Ladies fuchsia laminated vachetta leather strings thong slippers with leather sole handmade in Italy without the use of foreign labor or child, but by experts in the best tradition of craftsmanship. Ladies orange laminated vachetta leather strings thong slippers with leather sole handmade in Italy without the use of foreign labor or child, but by experts in the best tradition of craftsmanship. White greased vachetta leather tong sandals with leather sole handmade in Italy without the use of foreign labor or child, but by experts in the best tradition of craftsmanship. Silver greased vachetta leather gladiator sandals with leather sole handmade in Italy without the use of foreign labor or child, but by experts in the best tradition of craftsmanship.